Well, well...I am back in the kitchen indeed! At least for now. It's been a while, but things have been cooking outside the kitchen and in my real professional world - all for the better! Either way, I finally had a full day to myself and wanted to do nothing more than to go grocery shopping and to cook. I wasn't even sure what I wanted to make, but I knew I had to do something! Of course, I went on my merry way with not an idea of what I would be making later that night, but instead let what the store had on hand guide me towards what the final product would be. It was a nice day out today - a little balmy (considering), and even sunny! I felt like I wanted something light and refreshing, but still being warm and hearty. Sound impossible? This worked out pretty well! The fishmonger had a beautiful filet of halibut, and I realized how long it'd been since I've even eaten halibut, so the choice was clear! Picked up a few other goodies, and I was on my way back to the kitchen! 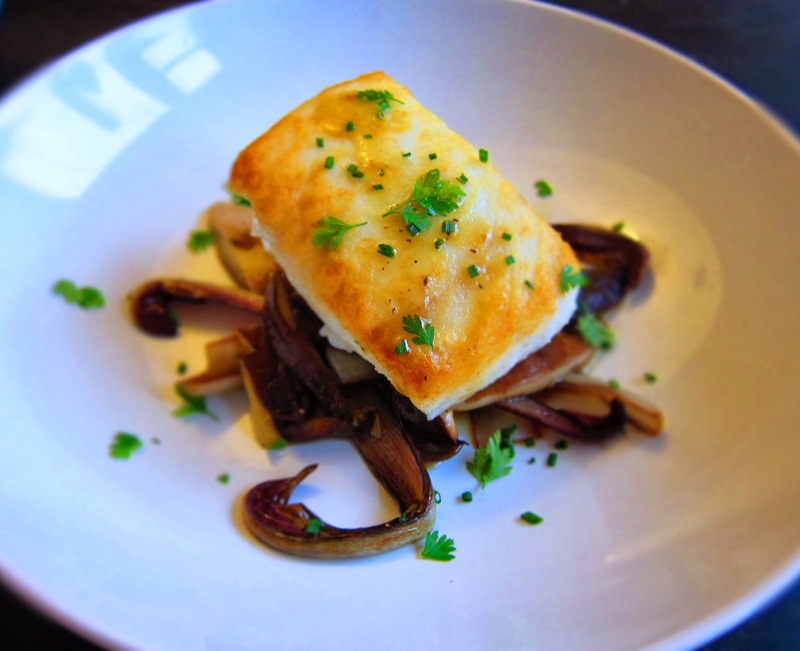 Shiitake mushrooms, rosso de treviso radicchio, and of course the halibut. I also picked up some chives, tarragon, and chervil (tarragon's quieter, more reserved little cousin) - because..why not! When you start to cook, remove the halibut from the refrigerator and generously salt. Leave out at room temperature. 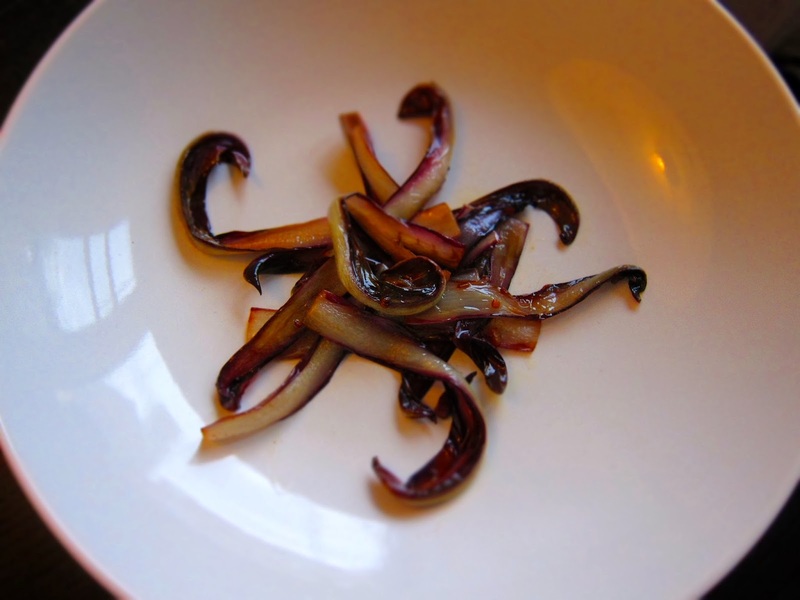 Start with the mushrooms - in a sauté pan, heat up about 1/4 cup olive oil over medium heat. 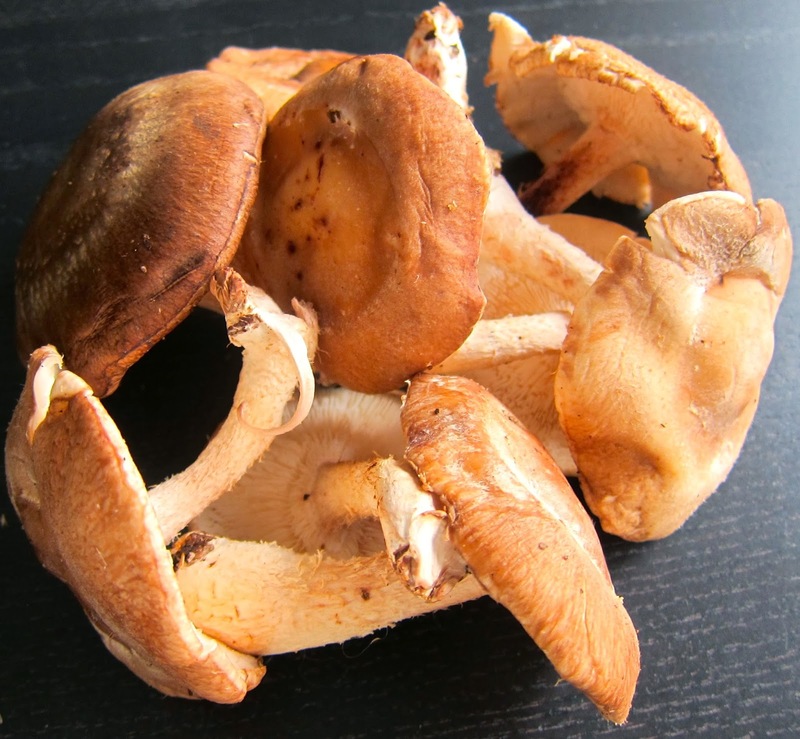 While the oil is coming to temperature, remove the stems from the shiitakes, and thickly slice. When the oil is hot, toss in the mushrooms and cook until semi-soft, about 5 minutes. Pour in chicken stock and bring to a bowl. Reduce to a simmer, and allow to cook for another 5 minutes, until the mushrooms are soft but not mushy. When the mushrooms are done, remove with a slotted spoon and keep warm. Set aside. You should have about 6 T left of cooking liquid - if there is more, reduce it down to that quantity. Pour out in a small jar and let come to room temperature. And now for the radicchio. In the same pan, heat up another 2 T of olive oil over medium heat. 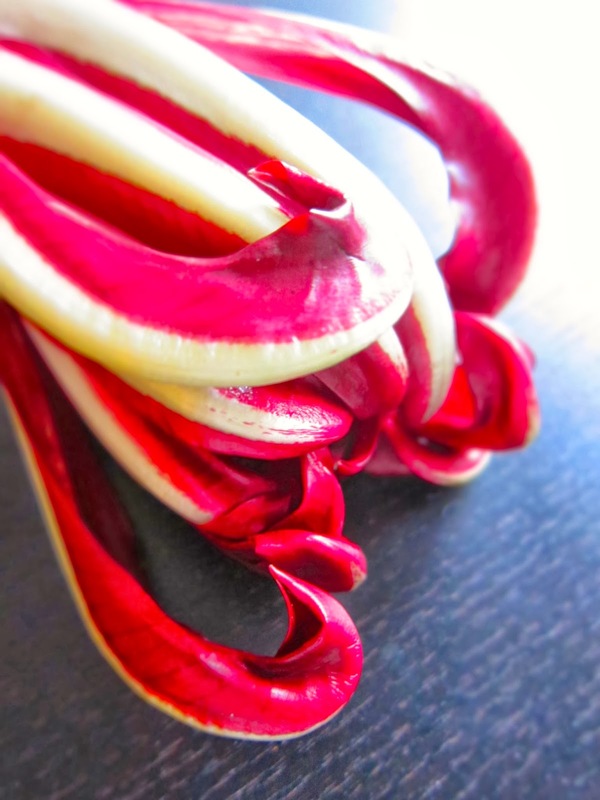 When hot, toss in the radicchio and sauté, stirring often. Don't let the radicchio burn, but make sure to cook out some of the bitterness. When just fork tender at the rib, pour in 1 t of sherry vinegar and toss. Taste for seasoning and add both salt and pepper. Set aside. When the cooking liquid from before has cooled, add in 1 T onion, 1 T garlic, 1 t sherry vinegar, 1 t balsamic vinegar, 3 T olive oil, and salt and pepper to taste. Screw the lid on and shake the jar to emulsify the vinaigrette. Set aside. Now for the halibut! Heat 3 T of olive oil in a frying pan over medium-high heat. 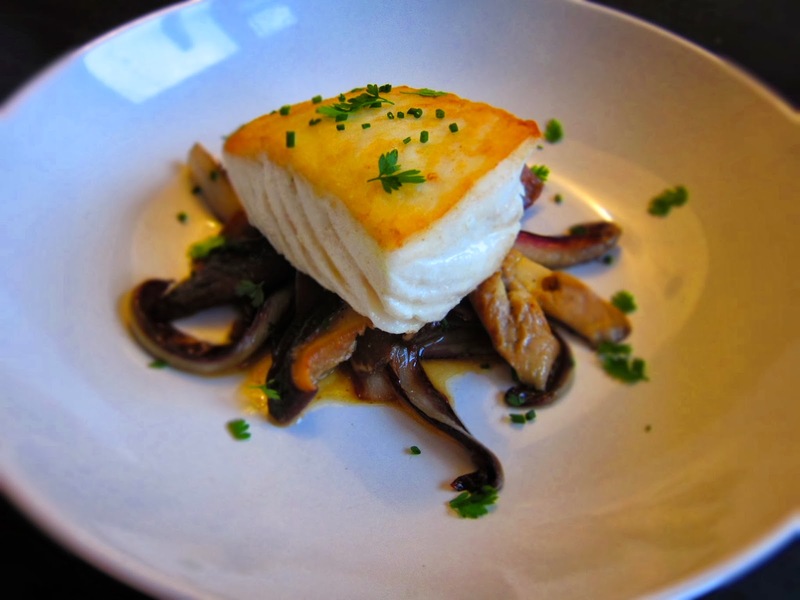 When the oil is shimmering, place the halibut flesh side down in the pan and let cook. Cook for 5-6 minutes, depending on the thickness of your halibut - either way, ensure that you get a crispy, golden crust before you flip the fish. When the fish "let's go" of the pan, flip and cook on the other side. I like my fish just cooked through - to the point that you can flake the flesh, but that it's still super tender and moist. As soon as you can easily stick a spatula through the flesh, it's finished! Remove from heat and get ready to plate. First, divide the radicchio between two wide plates. Toss the mushrooms with 1/4C of the vinaigrette, and plate the mushrooms atop the radicchio - reserve the liquid! Next, top the mushrooms with a piece of halibut and sprinkle with herbs. Finish with a few spoonfuls of the vinaigrette and a bit of salt and pepper. Dig in and enjoy! So tasty! Halibut is one of my favorite fishes (fish? whatever), so I'm biased regardless of what the other components of the dish were. But that doesn't matter one bit, because the other components went together perfectly with the halibut. The mushrooms gave a great earthiness, but weren't too heavy for the dish, while a nice, slight bitterness came out of the sautéed radicchio. The fresh herbs and vinaigrette brightened up the whole dish to bring it all together. Quite tasty!